Code development is a continuous process in both model codes/standards organizations (the ICC and NFPA). SBC will continue to be at the table to review and submit code change proposals in both arenas to ensure continuous improvement and technical relevance for all stakeholders involved with in- building emergency communications solutions. We will remain active throughout all phases of the code development processes. ICC - The International Code Council is a member-focused association. It is dedicated to developing model codes and standards used in the design, build and compliance process to construct safe, sustainable, affordable and resilient structures. Most U.S. communities and many global markets choose the International Codes, such as the International Fire Code (IFC) which is in use or adopted in 42 states, the District of Columbia, NYC, Guam and Puerto Rico. 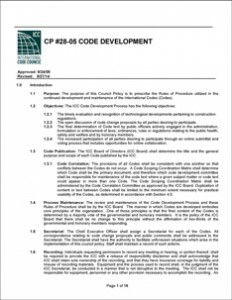 Download the ICC Code Development Process here. NFPA - Founded in 1896, the National Fire Protection Association (NFPA) is a global, nonprofit organization devoted to eliminating death, injury, property and economic loss due to fire, electrical and related hazards. The association delivers information and knowledge through more than 300 consensus codes and standards, research, training, education, outreach and advocacy; and by partnering with others who share an interest in furthering the NFPA mission. 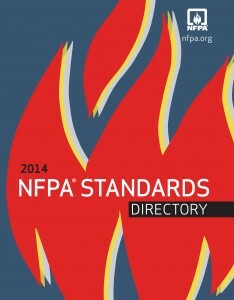 Download the 2014 NFPA Standards Directory here. 510.4.2.4 (2) Batteries in NEMA 4 enclosures. 510.5.1 PIM, compliance and safety testing after build. 510.5.4 FCC Compliance for Human Exposure. 510.6 Maintenance and design documentation. 510.6.4 (New Section) - As-Built System Documentation. 510.6.5 (New Section) – 24/7/365 Network Operations Center Monitoring. 510.6.6 (New Section) New Section – As-Builts in GIS format. 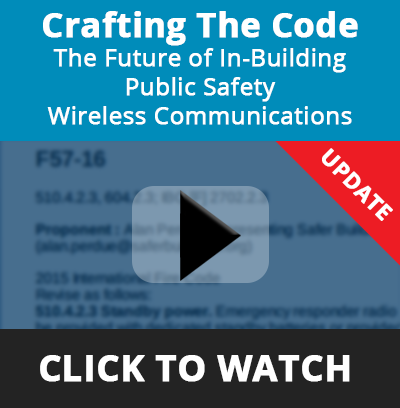 We work closely with our Safer Buildings Coalition members to develop these code proposals in a collective effort to shape the future of in-building public safety wireless communications.